In a crowded field of luxury-crossover SUVS, the 2018 Maserati Levante offers its own sense of style and luxury, but with a performance edge inspired by its Ferrari-derived engine. In true Italian fashion, the Levante is steeped in luxury trappings and high-tech equipment, and its performance credentials are enough to make the most ardent enthusiast drool. If your neighborhood is filled with Audi, BMW and Lexus SUVs, driving a 2018 Maserati Levante will set you apart in spectacular fashion. The Levante is similarly sized and priced with most rivals, so you don't have to sacrifice practicality for exclusivity. The Levante doesn't come cheap, yet its resale and reliability stats are probably going to fall far behind better-established makes like Lexus and Mercedes-Benz. You won't find a fuel-efficient hybrid or diesel model, but you will find a rather limited number of dealers. For 2018, the 5-passenger Levante gains a new electric power-steering system that allows Maserati to add driver aids like lane-keep assist. Two new trims, the GranSport and GranLusso, join the lineup, as well as some new appearance and option packages. Like the Ghibli it is based upon, the 2018 Maserati Levante rides low and wide, enhancing the sense of sportiness. It is more a tall wagon than a true SUV. The Levante has classic grand turismo looks, with cat's-eye LED lights, and the familiar Maserati shark nose and concave grille. Those details do more than give it a sporty appearance. The Levante is surprisingly aerodynamic, with a best-in-class drag coefficient of 0.31. For 2018, a new Nerissimo Package adds a blacked-out exterior treatment, 20-inch dark gray wheels and piano-black grille and trunk accents. Early-on, parent Fiat Chrysler Automobiles suggested the SUV would share its guts with the Jeep Grand Cherokee. Wiser Italian heads prevailed, and the production Levante is largely based on the Ghibli sports sedan. That's immediately obvious once you fire up the Ferrari-derived V-6 and slip it into gear. The driver-adjustable Skyhook damping system and electrically assisted hydraulic steering give you a clear feel of the road. More tall wagon than traditional SUV, that means you can slice through the corners and, despite its 4,650 pounds, you may soon forget you aren't driving the Ghibli itself. 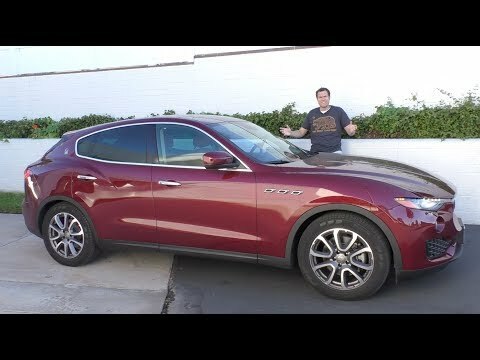 Even though Maserati decided to forgo the Grand Cherokee underpinnings, the 2018 Levante still delivers surprisingly solid off-road manners, thanks in large part to its electronically controlled suspension. You can increase ride height with the touch of a button and, should you forget, the Levante will automatically lower itself when you hit highway speeds. The base 2018 Maserati Levante starts with a Manufacturer's Suggested Retail Price (MSRP) of $76,285 including delivery charges. That jumps to $87,600 for the Levante S and gets you a handful of additional features -- most notably an extra 75 horsepower and 63 more lb-ft of torque. By comparison, you can get into a less well-contented Porsche Cayenne for as little as $61,650, though the German maker also nicks you for all sorts of features that are standard on the Maserati Levante. The Cayenne jumps to $78,450 for the 3.6-liter V-6 Turbo model, and goes all the way up to $119,150 for the V-8 Turbo. The curious can check KBB.com Fair Purchase Price to see what the Levante is going for in their area. We'll have to wait to see how resale values hold up after a year or two on the market. A 360-degree camera with multiple views makes it easy to maneuver Maserati's SUV in the tightest of parking spots. Even the base Levante offers an extensive array of safety gear, including emergency-braking assist and blind-spot monitor. The base car comes with an acceptable 8-way driver's seat but we'd prefer to see the 12-way buckets come standard at this price point. Other standard features include 19-inch wheels, bi-xenon headlights, all-wheel drive, an adaptive air suspension, heated front seats, Skyhook sport suspension, 8.4-inch infotainment with navigation plus Apple CarPlay and Android Auto. Looking to chill out? Opt for the refrigerated and cooled glove box. It'll keep that can of Red Bull at the ready when you're out for some hard driving. The optional Climate Package adds heated rear seats, heated steering wheel and heated washer nozzles. Also on the Maserati menu are heated and ventilated front seats, Alcantara headliner and pillars, a choice of harman/kardon or Bowers & Wilkins sound systems, 4-zone climate control and the Driver Assist Package that adds adaptive cruise control with stop-and-go highway assist. Given the Levante's height and sizable rear blind spots, the surround-view system is a welcome addition, especially when maneuvering tight off-road trails or confining shopping mall parking lots. The 2018 Maserati Levante's driver-selectable suspension helps keep all four wheels firmly planted, be it during aggressive track maneuvers or bouncing over unpaved dirt roads. Globally, the 2018 Maserati Levante will be offered with four different engine packages, though no diesels are currently scheduled for the U.S. market. Instead, we get two versions of the same, Ferrari-derived twin-turbo V-6 that can best be described as "fast and faster." Both engines mate to an 8-speed automatic transmission. All Levantes are all-wheel drive. The words "Maserati" and "SUV" may seem like strange bedfellows, but the public's love affair with all things crossover SUV has led to the formation of just such a union. No ordinary SUV, the 2018 Maserati Levante is draped in the same design language that defines Maserati's elegant sedans and coupes. The look can be somewhat polarizing, but in this segment, we think it works well. The Levante is practical yet also somewhat exclusive, which makes it the perfect antidote to the Audi Q5 and Porsche Cayenne. In true Italian fashion, the Levante is steeped in luxury trappings and high-tech equipment, and its performance credentials for both the base and upgraded "S" trim are enough to elicit buckets of drool from the most ardent enthusiast. A hot and cool mom car that is also practical! I love that it's sporty and also practical for my family. I also love that I don't see very many other people have them.